Take the guesswork out of engine tuning with Gunson's Colortune, the world famous glass topped spark plug that gives you a window into the combustion chamber so you can see the flame. Why is this important? The flame's color tells you the richness of the air fuel mixture. A yellow flame means a rich mixture and a bluish white flame a weaker mixture. A Bunsen blue flame is spot on. Colortune is so damn simple that anyone can use it. Colortune is unaffected by ambient weather conditions because it works on the law of physics that gases burn with a certain color. Remember high school chemistry lab and the Bunsen burner. So stop reading plugs and start tuning by color. The Colortune kit includes a Colortune spark plug, viewer scope, high tension lead, and cleaning brush. Cleaning fluid no longer comes with the kit due to shipping restrictions. Use carb cleaner to remove carbon deposits from Colortune. Colortune comes in three sizes: 10mm, 12mm and 14mm. Adapters are available for the 14mm Colortune only to adapt the 14mm Colortune to 10mm, 12mm, and 18mm applications. The 14mm Colortune fits the majority of cars and trucks; the 10mm Colortune typically fits motorcycles. Do look up your vehicle's make, model and engine size on NGK's site and note the first letter of the spark plugs' product code. Use the first letter of the product number indicates the Colortune of Colortune adapter needed. If unsure please email me. 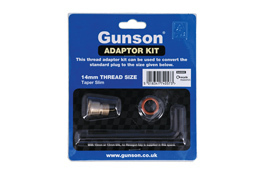 Use the first letter of the product code to determine the adapter. Remember colortune comes with 14mm threads. Give the wife a break! I don't know about you but my wife always helped me bleed the brakes. But there was a downside: I traded convenience for effectiveness. Something always went wrong. So to avoid hurt feeling and a poor job I searched for an alternative and found Eezibleed. This was way back in the early 90's when my 1985 Audi 5000s needed a master cylinder. The Haynes manual, which is published in England, mentioned a pressure bleeding tool called Eezibleed. At the time I worked for a multi national and traveled to England where I found Eezbleed in Halfords, got the phone number of the manufacturer, Gunson, rang them up and started my career as a purveyor of Gunson tools. Auto Expert Products started with the desire to help other do-it-yourselfer's with bleed brakes and have a long happy marriage. Eezibleed made brake bleeding a snap but then I learned about the brake fluid's propensity to absorb water i.e., it's hydroscopic. Diluted brake fluid leads to a soft pedal and loss of braking effectiveness. Here's why: Air in the system is the culprit but where does the air come from? The absorbed water in brake fluid breaks down the brake fluid's boiling point. As time goes on the situation gets worse until one day the boiling point is sufficiently low to allow the water in the fluid to boil and release air into the fluid. A friend had a Viper with a hydraulic clutch. The car became difficult to shift and the remedy was a new diaphragm and disk. But the problem wasn't solved and he was not happy. It took some time to figure out and a smart mechanic finally realized that the fluid line was too close to the exhaust header casuing the fluid to boil and creating air pockets. Fluid and water are not compressible but air is. That soft feeling is actually the compression of air rather than the movement of fluid. Changing brake fluid is important but what is the best method? The up/down method seems so simple and cheap but there can be complications. Pushing the brake pedal to the floor can move the master cylinder's rod too much damaging seals and dislodging sediment. Like plaque in your viens you don't want to dislodge sediment and have it floating through the hydraulic system. Synchronizing the up/downs with the action of opening and closing the bleeder screw is problematic and prone to human error. So while you can use the two person method be advised that more effective methods exist. You can drink water from a toilet but why would you want to? Pressure bleeding is perfect for cars with ABS. Before using eezibleed on ABS equipped cars pump the brake pedal 20 times to exhaust the servo. Eezibleed is easy to use, fast and thorough. Eezibleed beats the vacuum pump in job time and ease of use. Eezibleed is a one-man pressure bleeder that works off the spare tire or an air tank. But do keep the psi under 25. You want just enough pressue to maintain a steady flow of fluid but be advised that since brake tubes are small in diameter and the rear brake lines are longer than the front you may expereince a slower flow in the rear brakes than the front. Pressure bleeding requires a tight fitting cap. European cars with ATE reservoirs use screw on caps. Japanese and American cars use twist on caps. A reservoir with a twist on cap can not be pressurized so you have to use the multipurpose cap described on the left. Pressure bleeding requires a tight fitting cap. European cars with ATE reservoirs use screw on cap and a 45mm cap is included in the Eezibleed kit. Japanese and American cars use twist on caps. A reservoir with a twist on cap can not be pressurized so you have to use the multipurpose cap or the old school method with the help of an assistant. Copyright 2018 by Auto Expert Products Inc. Send an e-mail to AEP Inc.